Baltimore, MD’s Have Mercy recently revealed details for their upcoming Topshelf Records LP, The Earth Pushed Back, which drops on May 21. Our excitement was cultivated when we realized that the band recorded at The Magpie Cage in their hometown with indie icon J. Robbins producing, the 10 track album. The LP finds the band expanding on the powerful, yet melodic sounds they cultivated on 2012’s My Oldest Friend EP. In order to fully understand the breadth and scope of the band’s influence, Ghettoblaster caught up with Have Mercy’s Brian Swindle to talk about his favorite record, Dear and the Headlights’ Drunk Like Bible Times, as well as his favorite Have Mercy output. This is what he told us..
It’s hard to pick an all time favorite album. There are so many bands out there that have released perfect records. For this though I’ll go with Dear and The Headlights Drunk Like Bible Times since it’s been on repeat on my Spotify lately. Do you remember when you received or purchased the album? I do. 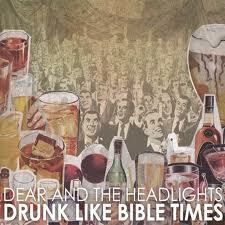 The band I played with back in 2008 played a show with Dear and The Headlights at The Ottobar in Baltimore. It was two days before the album was to be released and luckily I was “hooked up” with a copy. “If Not For My Glasses” is definitely my favorite track off that album. I feel like the lyrics are so obscure that somehow it’s easy to find a way to relate to it and find a meaning in the song. What is it about the songs that resonate with you? I love listening to CD’s that, subconciously, make me not even pay attention to the instrumentation. The songs on Drunk Like Bible Times are all about feeling and energy. It may take someone about three or four times of listening to a song to realize “Wow, how does he play that guitar part?” or “Wait, what harmony is he doing over that vocal track?”. The songs are so good you get lost. Have you ever covered a song from the album? I love covering the song “Try.” Ask me to play it sometime. I will. What is it about the album that makes it stand out against the band’s other output? This was Dear and The Headlights sophomore studio album and to me, a band’s second full-length really tells a lot about what they’re capable of and if they’re consistent. Their first album Small Steps, Heavy Hooves was what made me fall in love with these guys. When I heard they were releasing another album and listened to the first single, there wasn’t a bit a disappointment. It was Dear and The Headlights v2.0. They took it to a whole…notha…level. Have you ever given a copy of this record to anyone? What were the circumstances? I’ve given this record to a bunch of people. Whenever there’s an album I fall in love with I feel an obligation to show it to everyone. If it’s good, people need to know about it. Which of the records that you’ve performed on is your favorite? Have Mercy has only released one EP, My Oldest Friend. Our new record, The Earth Pushed Back, is coming out in May and is definitely my favorite I’ve performed on. The sound is more raw and the songs are more powerful. Working with J. Robbins is such a treat. He’s a musical madman. Going from tracking every instrument separately to recording together changed everything too, and that’s what we did with J. My favorite song on our new album is “Living Dead.” It was a complete 180 for us but when writing it we were really able to test our strength as musicians and song writers. The other guys in the band are very smart musicians and whenever we get a chance to sit in a studio and write and record something, especially with an abundance of instruments, it’s a feeling like no other.